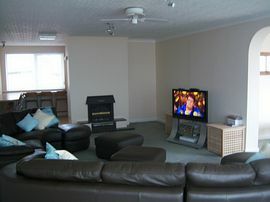 Looking for a spacious property to holiday in? then look no further, Gannel view offers a luxurious home from home accommodation for 22 people, it is a large well equipped house on the Pentire Headland and is a stones throw from the famous world class surfing, Fistral Beach. If you can fit it in it is conveniently positioned for touring the whole of Cornwall. 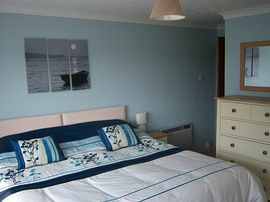 Relax in one of the 10 bedrooms with amazing sea and estuary views, 9 of which are en suite, all with TVs (some digital with DVD player). Enjoy the ample living space the house has to offer. A large sitting room with soft leather sofas, a 37" Sky TV with further seating in the bay window, where you can sit and watch the world pass by. A dining room with oak tables and benches for those all together meals. A breakfast bar area to sit at and enjoy a quick snack adjacent to the well equipped kitchen with American Fridge Freezer with water and ice on tap. A games room/ 2nd sitting room with a games console, board games and books, leading to a laundry area and pool table room offering a further space to just unwind and have fun. The enclosed garden with seating and a BBQ is amazingly sheltered with breathtaking views of the tidal Gannel Estuary, there is also a paved patio area outside the dining room. Ample parking. This all year round accommodation is ideal for families and groups looking to holiday together with the advantage of being able to enjoy the flexibility of the space that Gannel View has to offer. There is so much to do in and around Newquay, a week will never be long enough! Fistral and Crantock beaches, the famous tidal Gannel estuary, Golf, Horse riding, Surf Hire and lessons, Coasteering, Boat trips from the picturesque harbour, Newquay Zoo, Aquarium, pitch and putt, the famous Newquay road train, pretty coastal footpath walks and much much more are just on the doorstep. There are many places to eat from cafes and bars to the world renowned Jamie Oliver's 15 restaurant not far away at Watergate Bay. We guarantee you will want to return, in fact some of our our guests already are! 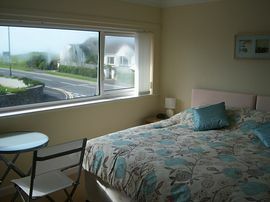 We welcome short breaks outside of main holiday seasons and offer a 5% discount if 2 consecutive weeks are booked. Travel cots and high chairs and other baby equipment are available on request. Linen, bath towels, electric, central/electric heating all included in price. Surfing lessons, coasteering, horse riding, paintball, ten pin bowling all pre bookable through us. We are now able to arrange for a beauty therapist to come to the house for those little well earned pampering treats, please email for more details. Also now available 2 for one green fees on many of Cornwall's fantastic golf courses. We look forward to meeting you when you come to stay, we personally manage this property and live only a few minutes away should you need any assistance. Amazing place for groups to gather, very spacious. 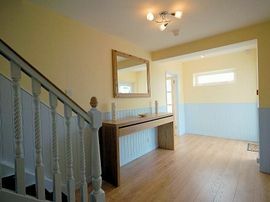 Brilliant location, 5 mins from Fistral Beach. Small enclosed garden, picnic tables, BBQ. Additional enclosed paved area outside dining room. Local Services: 5 mins from Fistral Beach. lovely walks. Pitch & putt very close, not far from all of newquay main attractions. 1. At J31 on the M5 branch left then merge onto the A30 ( signed Bodmin). 2. After approx 75 miles take the exit off of the A30 signed Newquay. 3. At Roundabout ( Highgate Hill Roundabout) take the 3rd exit onto the A39 ( signed Weadbridge/ Newquay ). 4. At next roundabout ( Halllon Roundabout) continue on the A39 by taking 2nd exit ( signed Newquay ). 5. Continue along A39 for approx 4 miles and at roundabout ( Quintrell Downs Roundabout ), take 2nd exit onto A392 ( signed Newquay). 6. At next roundabout, 2nd exit ( signed Newquay/Redruth ). 7. At next roundabout, 2nd exit continuing along A392 ( signed Newquay ). 8. At next roundabout, 1st exit into Gannel Road ( signed Town Centre/Pentire/ Fistral Beach). 9. Continue up hill and at next roundabout ( Mountwise Roundabout ) take the first exit onto Pentire Rd ( signed Pentire ). 10. Stay on this road for a bit less than 1/2 mile and the Gannel View is on the left hand side. Mid week breaks and long weekends are available out of the main letting season, please enquire for availability and prices. 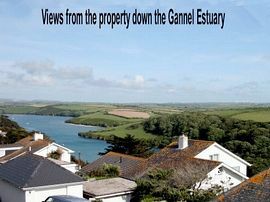 Gannel View is available for holiday let 52 weeks of the year.